Enter the magical, musical world of the Crystal Kingdom in the all-new Nickelodeon feature-length adventure Dora the Explorer: Dora Saves the Crystal Kingdom. Along with this never-before-seen title episode, the DVD includes two additional adventures from the top-rated preschool series. 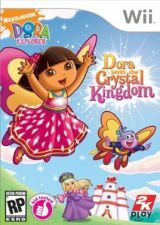 Dora Saves the Crystal Kingdom , Dora continues her magical storybook adventure from last fall (“Dora Saves the Snow Princess”), when the magic crystal that the Snow Princess gave her brings to life another character in her storybook – Allie of the Crystal Kingdom. A greedy king has stolen the crystals that give Allie’s kingdom color. Dora and Boots must help Allie locate the crystals and turn the pale gray kingdom back into a colorful wonderland before it’s too late. opens up a brand-new personalized online experience at www.dorapuppy.com. The product launch follows the storyline of Dora’s adoption of her new pet. Puppy" DVD for $4.99 with a $20 Dora Loves Puppy purchase (from Sept.
We were sent Dora Saves the Crystal Kingdom on DVD and Dora’s Christmas CD to review. I think my daughter is now in love with Dora and I don’t find Dora so annoying anymore. I didn’t used to like her, maybe it was because I always wanted to take a nap and her singing always woke me up. I love Christmas music and was happy that I could add another children’s Christmas CD to our collection of Christmas Music. Zoe loves it too. She always requests it when we are in the van and when I put it on the other morning she didn’t like that mommy added some other CD’s to the playlist. She only wanted to listen to Dora, not even our Mickey Mouse Christmas CD would do. 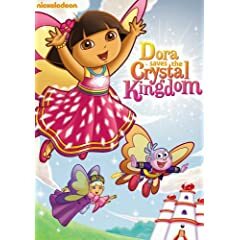 I have one copy of the Dora saves the Crystal Kingdom DVD to giveaway and one copy of the DVD to giveaway. Tell me something about one of the other Dora Products listed above. Dora’s Christmas is available in stores nationwide and on iTunes on Tuesday, Sept. 15. And could make my nice very happy! Thank you! The Dora’s Christmas CD is available on iTunes. Dora Loves Puppy line has stuff for home, apparel, games, sporting goods, footware and more!! The Dora Links doll features an older Dora who lives in an online world with her new friends and attends school in the big city. Dora loves Puppy is an exclusive item to Kmart stores, thanks. Dora’s CD is available in stores nationwide and on iTunes September 15. Thank you for the giveaway. My little granddaughter loves Dora. # 1 – I voted (#223) Thanks! # 2 – I voted (#223) Thanks! # 3 – I voted (#223) Thanks! # 4 – I voted (#223) Thanks! # 5 – I voted (#223) Thanks! I follow you on Twitter. My username is: nanatide. Thanks! Authentic character voice of Dora and other characters from the Dora the Explorer TV Show. You can download it on iTunes! Dora Loves Puppy can only be purchased at Kmart. I commented on your CloudB giveaway! The Christmas DVD has classic carols with a Latin twist. The Dora Links doll can be hooked up the computer. My children would love the Wii game, which is available thru Amazon for $40 with free shipping! I learned from above that by plugging the Dora Links Doll into a computer, girls can access Dora’s brand-new, exclusive interactive online world. How cool is that? I voted for this blog on Devine Caroline I was vote 308. Dora’s CD is available in stores nationwide and on iTunes September 15. I purchased the wii game at WalMart! The Dora Saves the Crystal Kingdom DVD is very cute! We rented it and my daughter loved it! The Dora loves Puppy items are available exclusively at Kmart! The Dora wii game is available at Walmart!! I learned that there is a new line available exclusively at K-mart. The Dora Links doll can have her eye color or her hair length changed by hooking her up to a PC and changing her looks! How cool is that?! The Dora CD is available September 15th. The Dora Links Doll is cute for the kid that has grown up with Dora (but now a little to old for the preschool version).Thanks! The wii game is available at Walmart. this would be perfect for my niece for Christmas! thank you! My son would love the Dora loves Puppy line. He loves Dora and puppies so much! Thank you! The links doll is very cute.. she has a whole online world. The Dora Links features an older Dora. They only sell the Dora loves Puppy at Kmart stores. Dora loves Puppy is exclusive to Kmart. The Dora Links doll connects to the computer and you can play games with her… my lil Steffie would love that!